In Travels With Charley, John Steinbeck, at the age of 58, disillusioned by his fame and literary success, realized that he had not actually seen the country he had become so famous for writing about in some time. Feeling like a fraud, he resolved to travel across the backroads of America in search of the country and sense of national identity that eluded him. 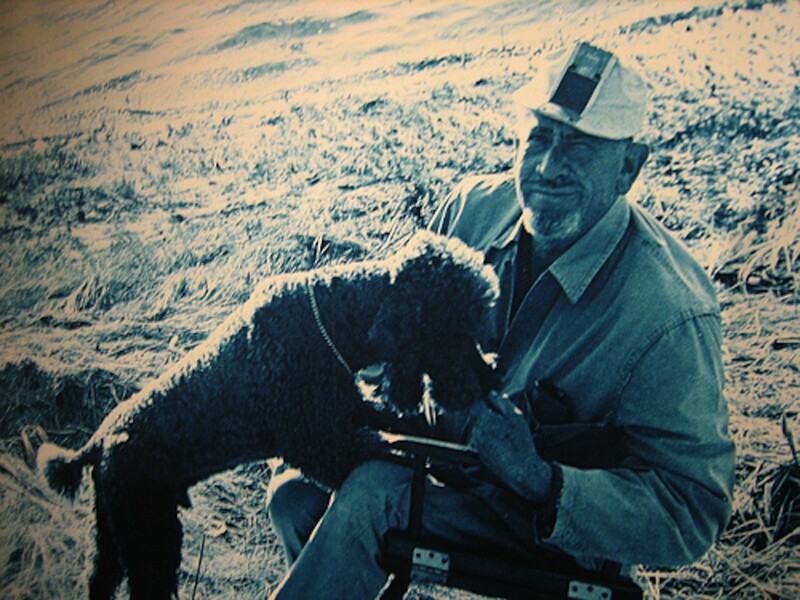 Deciding to take his journey with his French poodle, Charley, instead of his wife, Steinbeck ordered a custom GMC pickup/camper (which he dubbed “Rocinante” as a backhanded allusion to Don Quixote’s horse) that was outfitted with a bed, a propane stove, a table by which he ate, read and wrote, and the myriad creature comforts and conveniences that were available to him in the fall of 1960 when he set out on his trip. Although Travels With Charley is a lesser known work of Steinbeck’s, I imagine many of the CC readership have read it or even regard it dearly as one of the great travelogues, alongside Kerouac’s On the Road and Least Heat Moon’s Blue Highways. Suffice it to say that the America Steinbeck encountered was not a bed of roses: He was left befuddled by the wrath and smoke of progress that besmirched his hometown of Salinas and had made Monterey and Seattle almost unrecognizable to him. He found that Americans had become dulled and satiated by technology and that superhighways knifed their way through the countryside, making it possible to “travel from New York to California without seeing a single thing”. 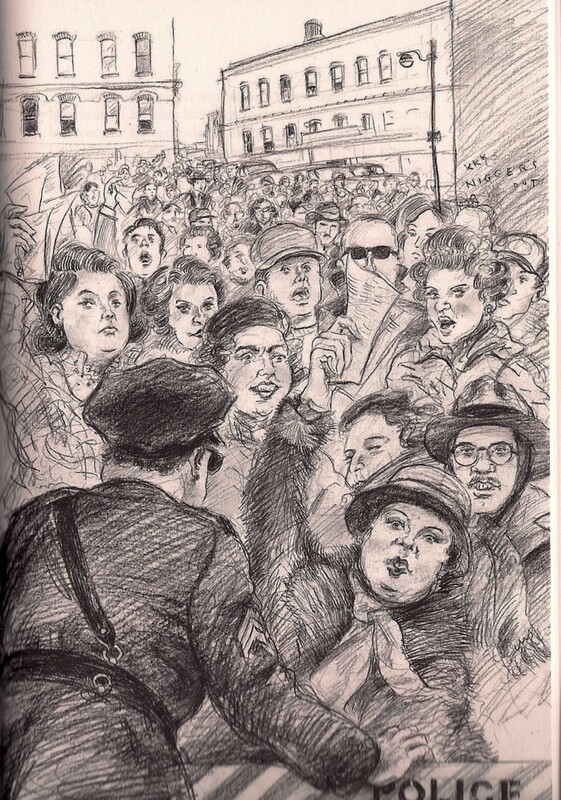 In the Deep South, Steinbeck witnessed the ugliness of (the process of) desegregation in public classrooms in New Orleans, and his journey concluded prematurely, offering more questions than answers. As a college English teacher, I like to teach Travels With Charley, because it raises many questions about American values, and it makes us think about how we either evolve to suit the changing nature of the times, or get left behind like ghosts. I also like that many students, whether well traveled when they come into my classroom or not, like to imagine just what is out there in this great, big country of ours. If I can stoke the fires of wanderlust in them, then at the end of the day, this job is about much more than just a paycheck. We teachers believe that books are our ambassadors of extra-somatic knowledge; that this is how we pass our lessons down. Books can profoundly broaden our worldviews, but can they hurt us too? Is it possible to read too much into a book and to go off the deep end? 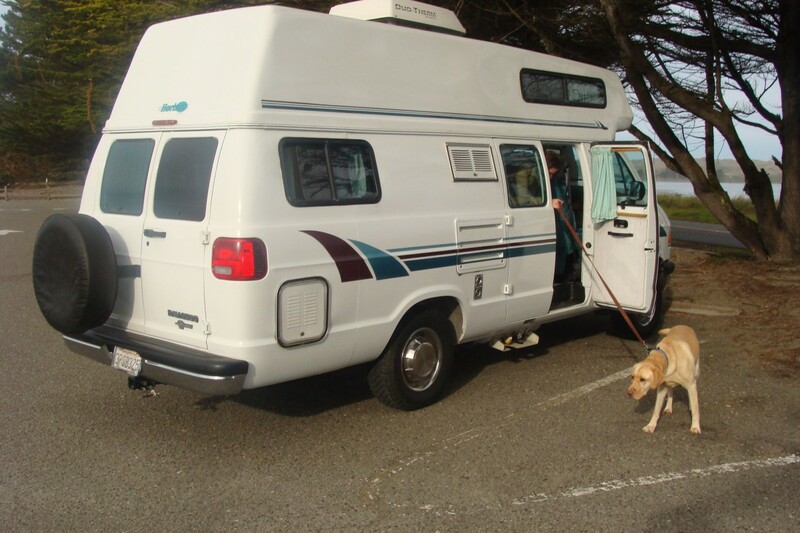 After a few years of teaching Travels With Charley, raising a Labrador retriever that I named after Steinbeck’s dog, how could I not subsequently get myself a self-contained vehicle and begin a journey into the heart and soul of America? How could I teach this book without knowing whereof I speak? 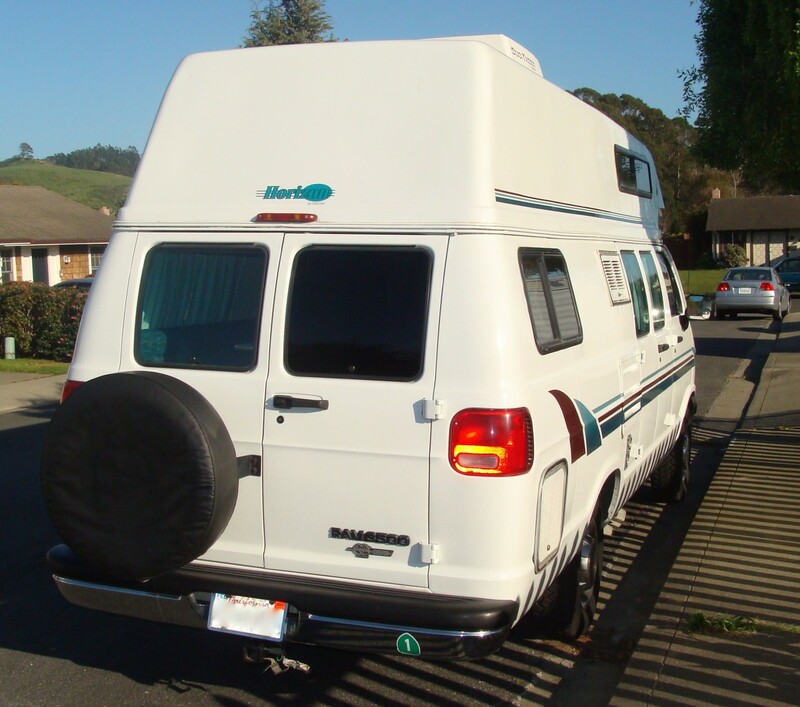 This was my justification for spending more money that I ever have on a vehicle before, and plunging headlong into a fantasy that was a nutty, profligate indulgence: a 1996 Dodge Horizon Class B RV, self-contained with a sink; a propane stove with 2 burners; a Dometic 3-way refrigerator; a microwave; heating and cooling systems, a toilet; a shower; storage space galore; dual batteries; inverter; electrical hookups, and more. Purchased from an ailing Vietnam veteran, the van seemed to me a steal at the price. Everything in it worked (though someone had made a few botch-job aesthetic repairs), and the thing had a mere 84,000 miles on the clock. Nearly 18 years old when I bought it, it also came with a profound, fecund, fetid stink that I was never able to completely neutralize. Full of the uneasy nervousness that pervades one before he dumps down a quarter of his yearly salary on an unproven vehicle, I dimly remember the previous owner asking me “are you sure this is what you want” as I doled out ludicrous wads of hard-earned cash for the purchase. With the paperwork signed, the handshakes shook, and the last of my tentative worries momentarily quashed, I took the helm of my new barge and began the maiden voyage out to Millerton Lake in Friant. Plugged in and camped out! Look carefully and you’ll see Charley’s muzzle fogging up the glass! The vehicle’s shortcoming immediately began to present themselves. The lumbar support in the plushy captains’ chairs was awful and left my back screaming after 15 or 20 miles. Although the steering was tight, I had to get used to the onerous manpower it took to stop the vehicle. It was clearly a beefy piece of American iron, manufactured in the ’90s, but rode like it was from the ’80s. It reminded me a little of my brother’s Chevy Blazer from the same era that never felt like it could come to a complete stop. I’ve heard CCers lament the left leg problems in Dodges of this era. The wheelwell left me with nowhere comfortable to rest my left leg as I cruised down the highway, which was jammed with traffic and oglers of a grizzly wreck. Not an auspicious start to my first journey! Suspension was floaty on the freeway and no matter how fast I went, people wanted to pass me. The most comical part of it all? The passenger-side mirror kept flapping inward, leaving me with no visibility where I needed it most. I held my breath and muttered a Hail Mary every time I changed lanes. 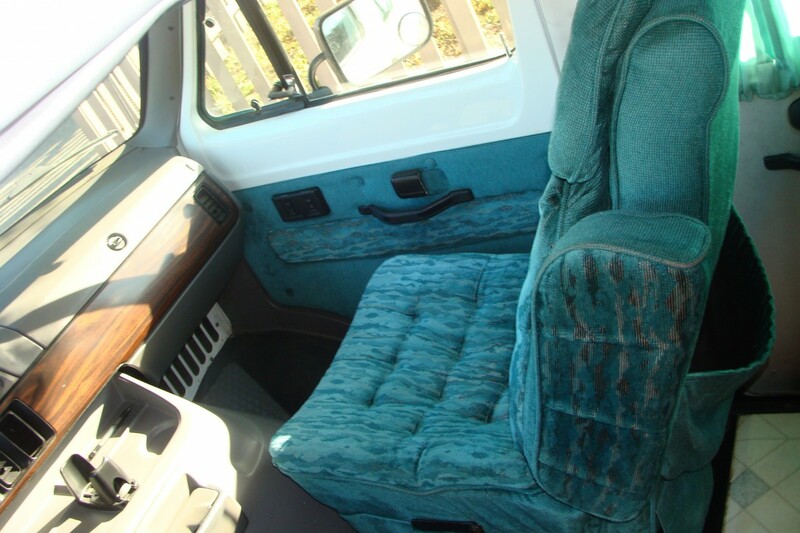 I remember lowering the window and booming the mirror back into place with the handle of the broom the previous owner had left behind in the van’s bathroom. Trial by fire, indeed! Lake Millerton was beautiful once I found it, and the van’s king sized bed was sturdy and comfortable. After plugging the van in and verifying that everything seemed to work, I was almost able to forget about the 200+ mile drive back home I would have to undertake the following day. 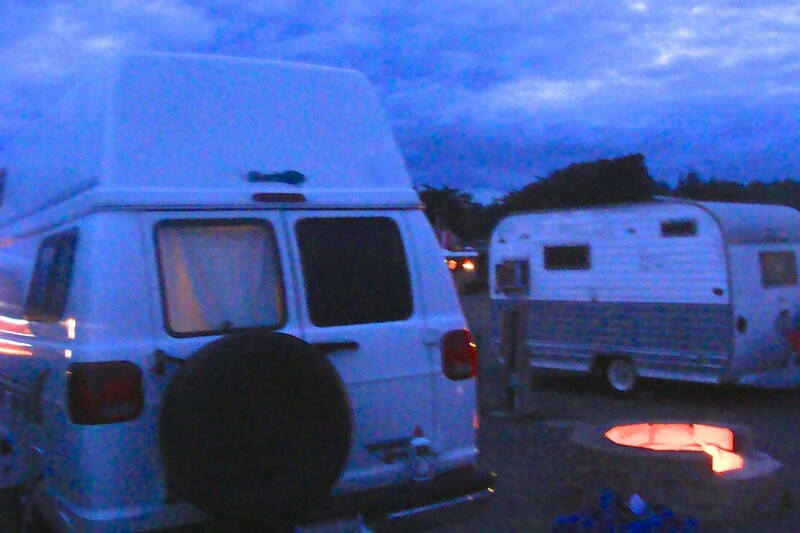 As nightfall arrived, Charley curled up at my feet in the bed like the RV was the most natural home he’d ever been in. 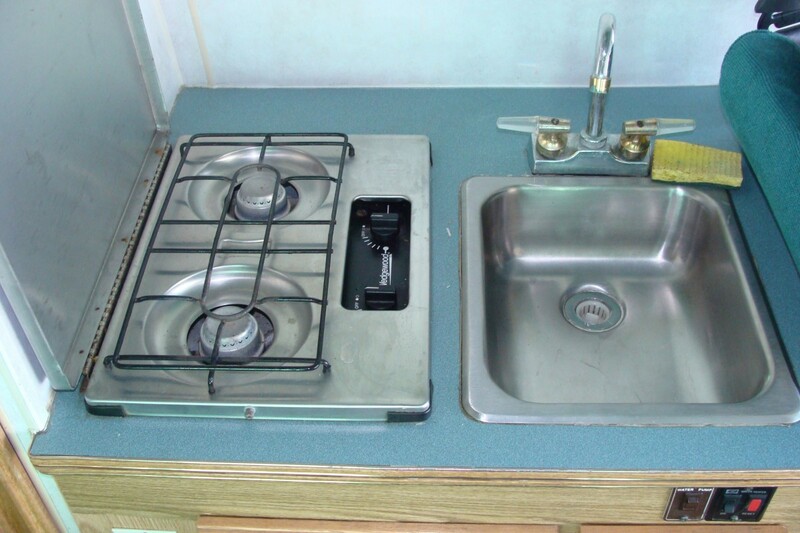 After the white-knuckled ride home and several small trips for acclimatization, I began to enjoy the RV for what it offered: Cold beers in the fridge, a place to rest and go to the bathroom any time I got the urge, a complete kitchen with which to prepare meals, etc. I know CC has covered conversion vans before, but I’m not sure about Class B motorhomes. 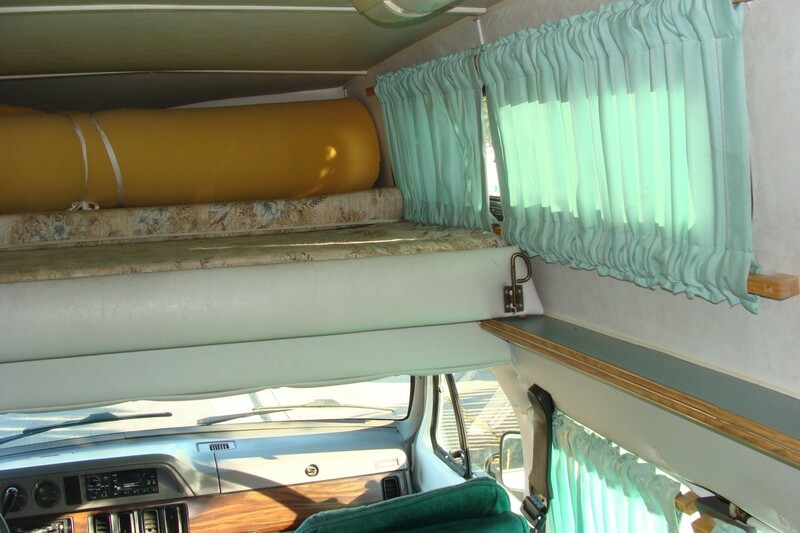 Class Bs are the most expensive kinds of RVs because they are not “stick and tin” constructions once you get past the van cab the way most other RVs are. Cheaply constructed Class As and Cs are prone to all kinds of problems: rust, mold, rot, you name it. Most of these Dodge Class Bs were assembled in Canada and then shipped south and sold to an American clientele. 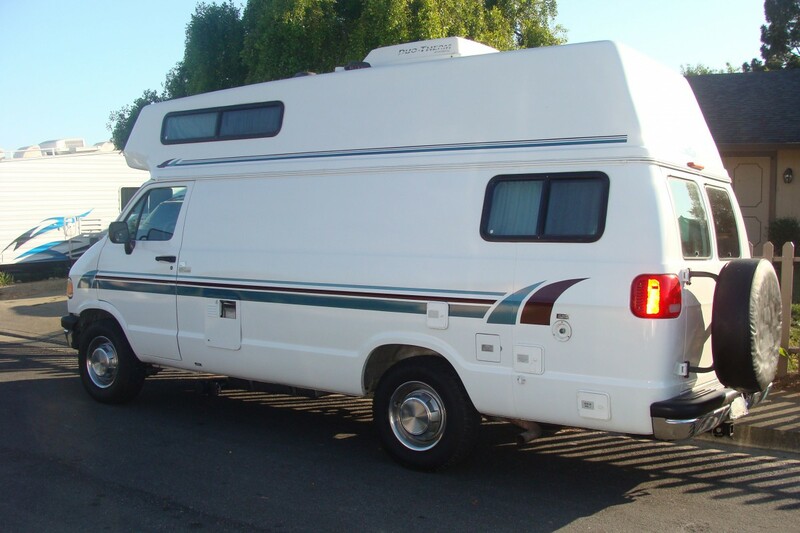 This particular one was originally sold in Nipomo, CA, and is called a “Horizon,” though it appears to be similar to the “Phoenix” conversions that abound. At 19ft, it was easy enough to park in relatively small spaces, though I was always uneasily thinking ahead about how I would navigate my way out of spaces and places. 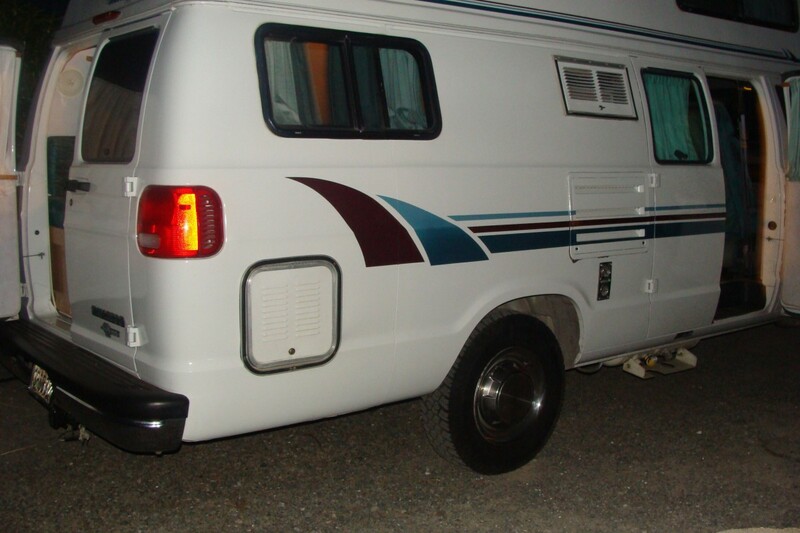 Unlike the Roadtreks and Pleasure Ways that are popular with the RV crowd, this particular RV had a second bed above the cab that slid out along a track to create an additional twin size bed. I never used the bed; that area was storage space for me. Charley felt completely at home crashing out on the sofas in the rear, whether they were upright or made into a bed. 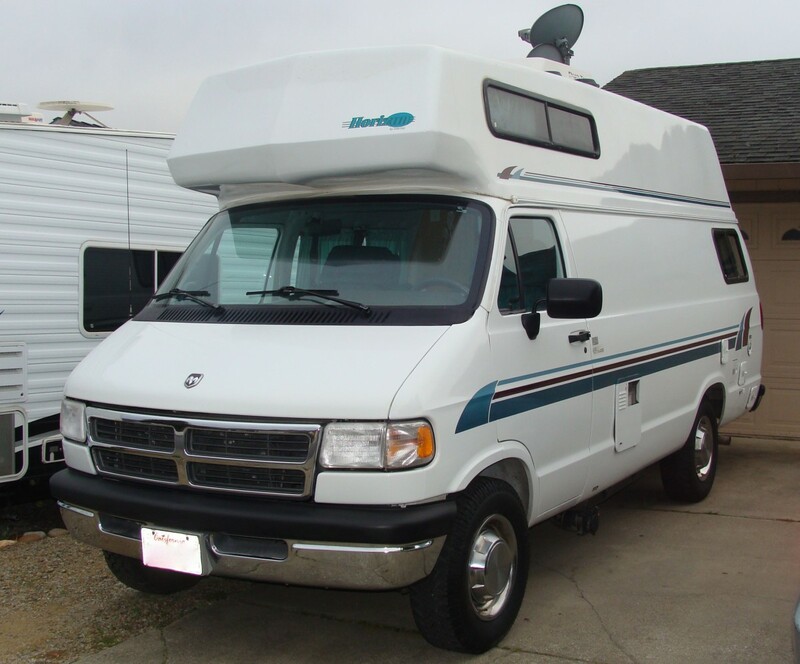 This RV was built upon a Dodge Ram platform and is essentially a RAM 3500 van that has been extended three feet in the back, with a raised camper on top. Peaking out from atop the extra foot or foot-and-a-half of the roof was a Dometic central heating unit. The combined roof height left me wary of car washes and drive-thrus– anyplace with low clearances. The van featured a 5.2 liter V8 that had 220 horsepower and I had no trouble hitting 80 miles per hour on the freeways. The torque specs were listed at 295 @ 3200 RPM. 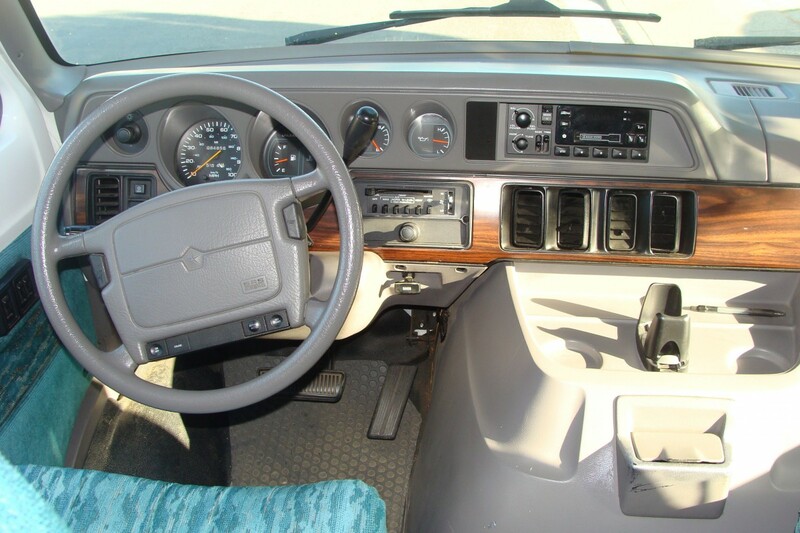 This particular RV was decent on gas, averaging in the 12-16 MPG range. Mine came equipped with some Goodyear mudder tires that had some dry rot cracking in the wells, but plenty of tread. I never did change them, as it would have cost a grand for five of those things. The van was good to me. During my stewardship, I never encountered any major problems, but my conscience nagged at me for spending so much money on a second vehicle. Soon, my faithful Subaru Outback pulled a dreaded P0420 code, which my mechanic informed me was going to result in the catalytic converters (apparently there are two of them) needing to be replaced–a costly job. March rolled around; I did my taxes and my taxes did me in. I decided to put the RV up for sale. 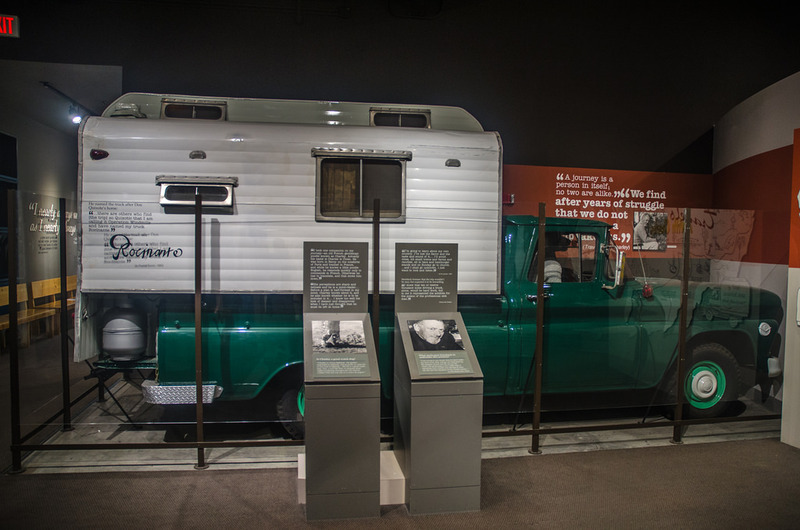 After receiving a spate of calls from interested Craigslisters and listening to their stories and motivations/interests in purchasing an RV, I became aware that many of the observations Steinbeck made back in 1960 still hold true today–moreso, even. It seems to me that there is a burgeoning crowd of 20- to 30-somethings who are disillusioned with the workaday world and long to escape it by shucking their mortgages and cubicles and setting out for an endlessly changing horizon. Many, many people spoke of wanting to go “off the grid” in search of something better, something outside the smoke and plume of the big cities. Clearly there is something magnetic, exhilarating and Zen-like about downsizing, simplifying, and living a nomadic lifestyle. Now that I’ve gotten the RV experience out of my system, I can say this, however: Those who seek to escape the anxieties of the rat race are unlikely to find their saving grace behind the wheel of an automobile. The place to look is inward and not outward. The beauty of Travels With Charley is the way in which Steinbeck used Charley as a foil to show that in spite of how bright and superior we humans think we are, we could stand to learn a lesson from a “lesser” creature once in a while. In the novel, Charley, for all his doggy limitations, did not suffer from ennui, an inflated sense of self-worth, racial superiority or any of the other human foibles and peccadilloes that Steinbeck discovered that dog our species. When I traveled in my van and looked over at Charley, head out of the window and ears flapping in the whipping wind, with a look of sheer contentment on his face, I realized that one doesn’t need an 8,000 pound vehicle to taste freedom; one just has to keep his eyes and mind open. Bon Voyage, Rocinante, and may all my fellow travelers and seekers find what they are chasing after! Never read the book – then again, I missed all the great American 20th century authors other than Fitzgerald due to having discovered Heinlein, Asimov, Clarke, etc. Will have to give it a look. As to the van: Once Maggie and I have decided that the current Kia Sedona is keeping us comfortable at the race tracks, and we’ve got a good head for van camping (as opposed to period-correct reenactment camping, which we currently do), I’ll be looking for one of those. My first wife’s parents had one back in the mid-80’s, which we took on family trips and I borrowed occasionally for medieval gatherings. Definitely want to go back to one of those again. What a wonderful article . . ! Nice. It seems to be the perfect size; big enough to stay in comfortably yet not as big as a city bus, so you can still go anywhere. Especially because of its raised roof it reminds me of the Chevrolet ambulances we had here. That’s why these Chevys are often converted into a camper after their ambulance-duty. Nice article. I’d always wondered why the Class B motorhome is so much pricier than the larger Class A or C.
One of the most disheartening things about self-contained highway travel across the US these days is the outrageous prices to stay in many RV parks. It’s, literally, equivalent to a room in a mid-level motel. I guess it’s just another outgrowth of those wealthy individuals who take to the road in those lavish, gargantuan, converted buses. When you’re traveling in a seven-figure RV, I guess paying the exorbitant price to stop at an expensive RV park isn’t much of concern. Personally, it seems like just using a minivan with an airbed replacing the backseats would be good enough for elemental travel. Isn’t that pretty much what hippies used to do when traveling in a VW microbus? It works, and its nice for a weekend trip. At my advanced age (64) however, I’d prefer a bit more creature comforts if I’m going to be on the road for a week or longer. One of the best things about using a nondescript minivan as a mobile, enclosed, bed-on-wheels for a single person is it doesn’t scream ‘RV!’, making it possible to travel (and potentially stay) at places where an RV might otherwise draw unwanted attention. Not to mention that a minivan will get substantially better fuel mileage than even the smallest, dedicated RV. I avoid RV parks like the plague. With a bit of resourcefulness, it’s not hard to do. The whole point of these is that they’re self-contained; they can go several nights and days before the tanks need emptying and replenishing. Out in the West, there is a lot of US Forest land and BLM land, where camping is allowed, unless specifically restricted. And while on the road, there’s always the back parking lots of an empty mall or such. Although on etime, we did get woken up by the noisy parking lot cleaning truck! There are web site dedicated to free places to camp overnight. Anyway, I have zero desire to be in an RV park which is more crowded than my neighborhood. That’s hardly my idea of getting away from it all. So Steinbeck went on his trip in 1960. 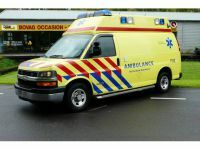 The illustration of the GMC truck looks like a 64-66 model. In 1960, a new GMC truck would have had a wrap around windshield . I remember seeing one like this near where I live. It was a 1978, maybe 1980, and although it wasn’t as nice as this Dodge Horizon, it was still a nice looking RV, and something I could easily drive. What a refreshing story. Thank you. Friends and I drove cross-country in a ’71 Pontiac in 1995. I’m glad I did and I enjoy the memories, but I returned determined to be part of a community again. For anyone who’s interested, check out the nonfiction book “Blue Highways” written by Native American writer William Least Heat Moon. Moon is also a schoolteacher ( I think ) who decides to leave the reservation and his old life behind after one too many nasty fights with his increasingly volatile wife, who ultimately deserts him. 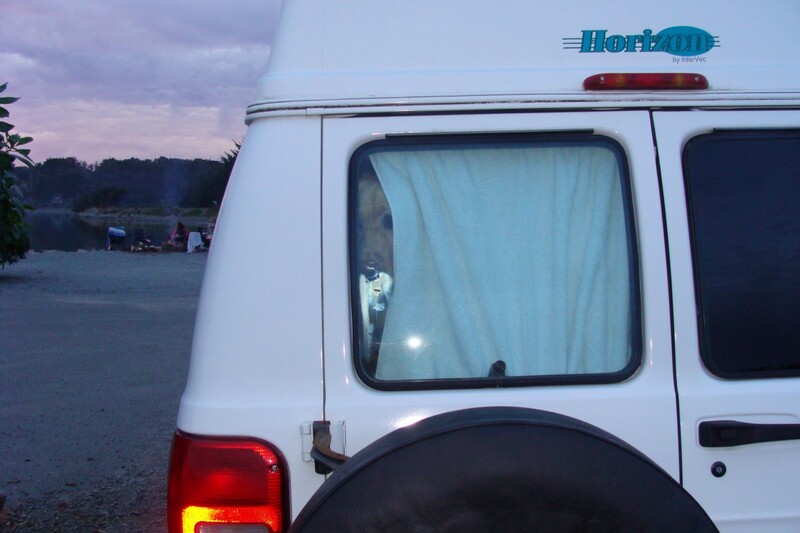 He takes the remainder of his savings and purchases a Ford Econoline cargo van the he names “Ghost Dancing”. For the next several months the van serves as his home and office while he travels America’s blue highways- roads well off the beaten path, to tiny little enclaves of civilization where time appears to have stood still. Great story and that van is in excellent condition! I’ve often wondered if anyone ever focuses on the driving dynamics of these (and other) rigs when purchasing or do the “accommodations” take up all of the pre-purchase thoughts. I’m guessing most test drives are of the “Ok, it goes, it seems to stop, but check out the king-size bed in the back!” variety rather than of any extended length and probably don’t even get on the highway. I’m glad you enjoyed it, to my eyes the last of the U.S. Dodge full-size vans are the most attractive of the trio. I had a 74 Toyota Chinook. No stove or icebox. So I used a regular camp stove and a 12 volt portable fridge. I enlarged the closet so I could stick a porta potty in there. It was a nice roomy camper with that pop top. Could get 21 to 24 mpg hwy. Nice looking conversion. 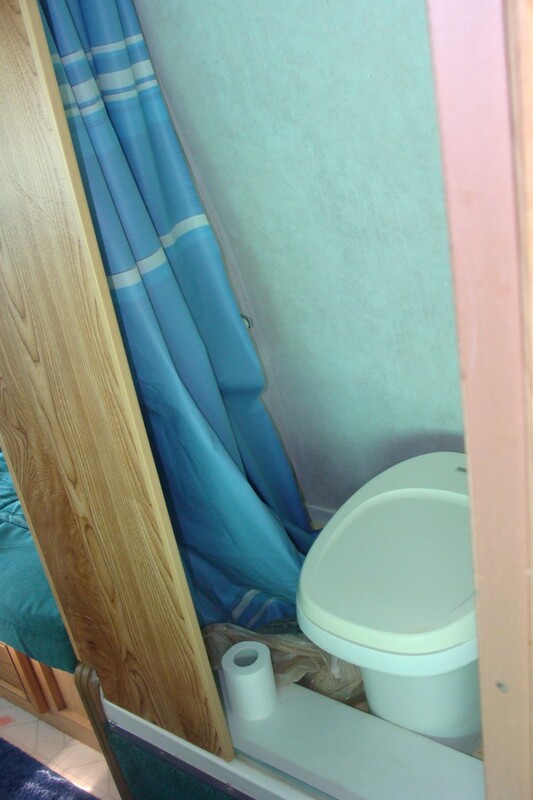 The only way to eliminate the “smell” is to get rid of the black water tank and plastic RV toilet. I had a few self contained trailers and removing that tank (but keeping the grey water tank) and adding a house type toilet connected to the grey tank always got rid of the smell. The plastic retains the odors no matter how clean you keep them. This did mean that while on the road you would need to find outside bathrooms, but it was worth it to keep the smell away. For a while I carried a portable, but the plastic in these would soon absorb odors as well. 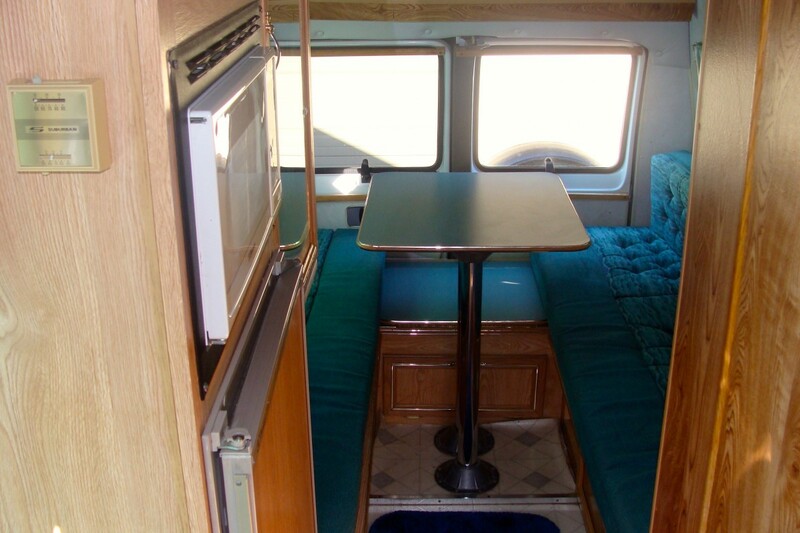 I also would avoid overpriced camping areas and use the self contained features of the RV. To me, since I always had pickup trucks, a travel trailer around 20ft modified as above worked well. You could unhook the trailer whenever you wanted to. Great post! I remember in the late 60’s everyone was fired up to go on the road, thanks to “On the Road” and “Travels with Charley”. Of course this culminated in “Easy Rider” which got me up on motorcycles. I just read Steinbeck’s book a few years ago and enjoyed it immensely. Reread “Blue Highways” and loved it too. 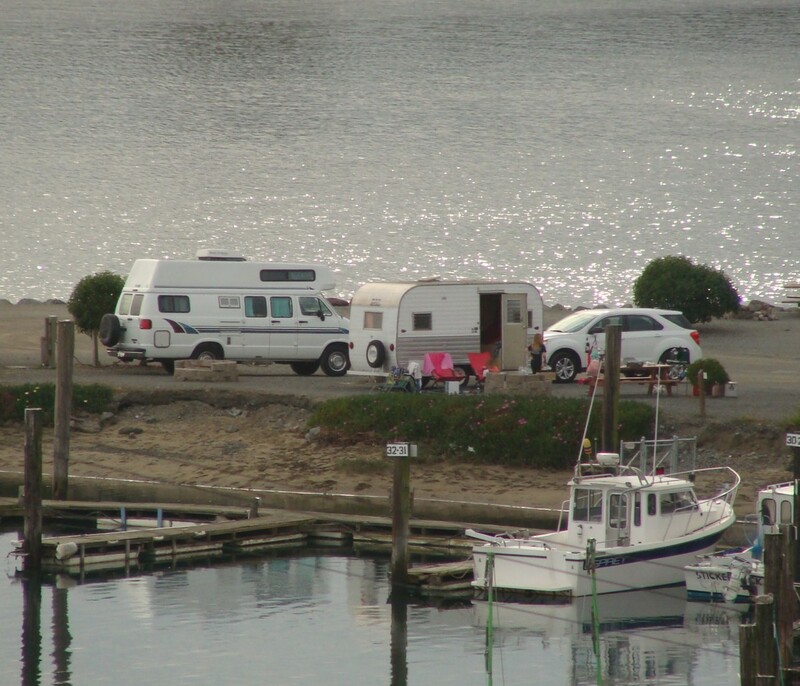 It would be nice to have the comfort of a big RV but the real point is to get out there-now. The mini van alternative is very doable and there’s no shortage of used ones out. Now that I’m older I don’t really want to rough it too much so I can see the appeal of the RV. If you are in the Salinas area the Steinbeck museum is well worth the stop. The displays provided a great back story for Steinbeck’s books. I had just read many of his books that I never got around to while in school. Rocinante is on display there too. Downtown Salinas is pretty nice during the day and there is a nice theater and some shops and small restaurants also. Good story, I did read Steinbecks book and loved it. Me and a friend travelled all over Europe and the Middle-East back in the late 80’s, using a Bedford CF van, powered (underpowered) by a Perkins 4-cilinder diesel. Would do it again in a heartbeat, but Syrië and other countries in the regio are not safe to travel at this moment I guess…..I should find me the pictures from thise trips and scan them…..
From what I’ve gathered there aren’t a whole lot of traditional Class Bs still being built. Most of today’s Bs are what’s known as a Class B+.. Instead of a standard 15 pax length van with a fiberglass topper, they’re (usually) a Mercedes Sprinter chassis cab with an aluminum and fiberglass body shell that’s only a few inches wider than the cab. They’re still much more fuel efficient and maneuverable than a Class C, but also much more expensive due to their construction. They also tend to be a lot more upscale than the old Bs with stuff like built in vacuum cleaners and Corian countertops available. Great submission! As I recall Steinbeck wrote positively of the truck’s powerful V6 engine(is this the big V6 that has been written about in this site?) and its quality being superior to the automobiles of the day. It went 10,000 miles reliably! 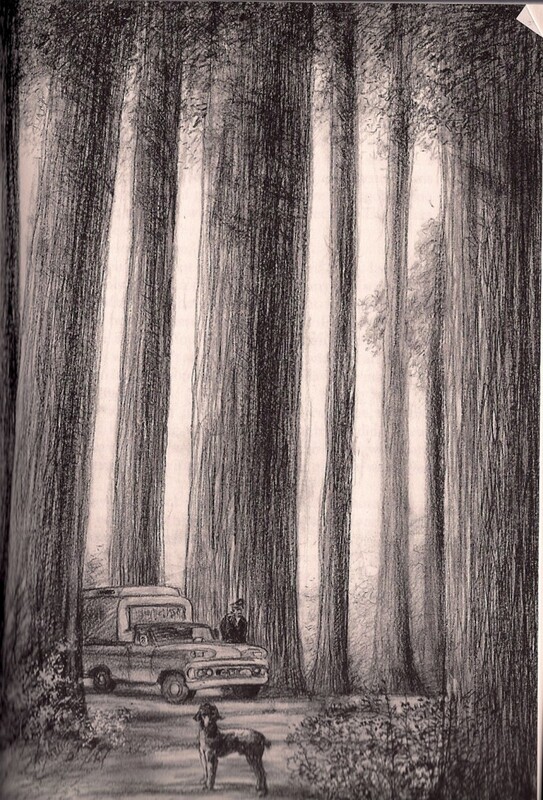 I would much prefer Steinbeck’s truck and camper to Heat-Moon’s Ford Econoline myself. Thanks for this. Made my evening. Hi Bill, I am familiar with your book, and did, in fact, email you about speaking to my class when you set out on your journey. I never heard back, which was too bad; my class would have loved to have engaged you in discussion. To be honest, whether or not TWC is “non-fiction” or “fiction” is an irrelevant quibble in my opinion. It seems to me less important to “dog” Steinbeck about whether or not every scene and conversation in the book was “real” and more important to think about what Steinbeck was using the forum of literature to bring under discussion – his evaluation of America. 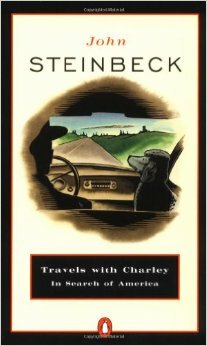 If students can think critically about what it means to be an American, whether or not the losses Steinbeck lamented are worth fighting for and about how the journey is more important than the destination, then it is rather trivial whether or not the book is factually correct or what genre one calls it. You can make a crusade out of picking holes in Steinbeck’s book, but it’s a shallow one in my opinion. Hi Scott. Sorry I missed your invite to appear before your class. I’d have been happy to have come to defend my book, my findings and my motivations. It would have been a great way to introduce your students to the age-old debate between fiction and nonfiction and discuss whether it matters when nonfiction writers fudge facts in the telling of greater truths. What Steinbeck and his publisher did to deceive millions of readers– and whether it was important for a journalist to point that out when he finds it out 50 years later — is not a shallow issue to me or many others in the journalism biz. The New York Times editorial page praised what I did and dissed Steinbeck for his fictions and deceptions. So have travel writer Paul Theroux and others. As for those great “greater truths” about America and its people that Steinbeck told us with his fictionalizing — now we’re talking shallow. As I argue, he basically arrived at them by reading the New Yorker for two decades and looking out his window at 50 mph. He did no research, no study, no deep thinking; they were his opinions and they were, in my opinion, silly and wrong. Also, what he really thought about the USA was too pessimistic and too dismal to share with his readers. All that and much more is in my book, which, whether or not you like its findings or conclusions, was a serious work of journalism that has changed the way “Charley” will be read forever. Invite me again, and if you’re not too many states away, I’ll present my case to your students. After reading your advertisement above, I checked the reviews on Amazon. I think I’ll pass. Thanks for the fair-and-balanced research, Dave. The reason I have to “advertize” my book is because a lot of people who should know better — for example, English teachers who teach “Travels With Charley” — still don’t know about it yet. Or just as bad, they’ve read my book but don’t think it matters that one of our greatest writers and his publisher sold 1.5 million copies of a book they told everyone was a work of nonfiction book ( i.e., true) when it was anything but. Here, you can see the original: http://steinbeckcountry.sutromedia.com/rocinante.html. I too loved Travels, fiction or non-fiction. 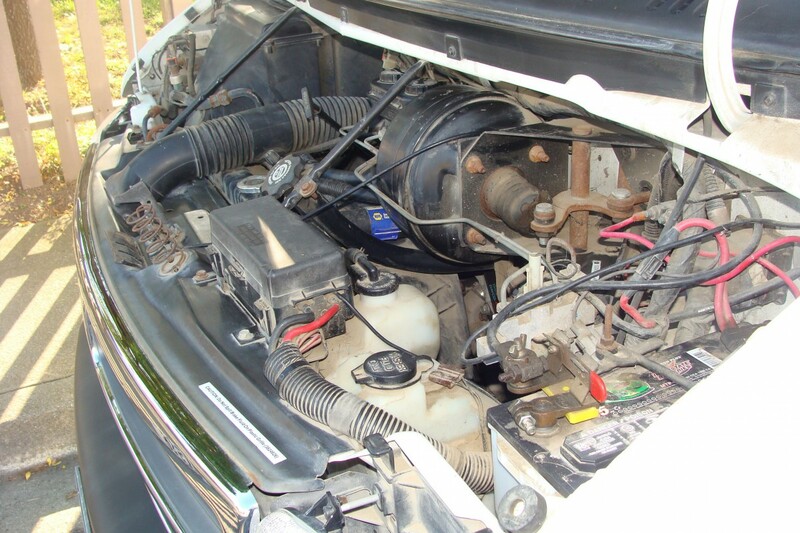 A GMC V6 was a great choice. I’ve included a pic of Steinbeck’s ride that seems important to the story. Lot of scuttlebutt that Steinbeck fibbed a few stories and some of his dates apparently don’t match up. Also accused of staying in a few hotels along the way. but whatever.